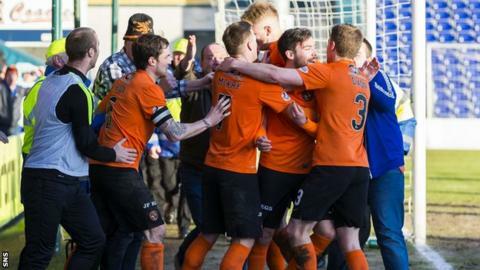 Dundee United manager Mixu Paatelainen believes Saturday's 3-0 win over Ross County has given his side a chance of avoiding relegation. He concedes United still have much to do, though, sitting eight points behind Kilmarnock with a game in hand. "Results have improved recently but throughout the season they're not good enough," Paatelainen told BBC Scotland. "We are still quite far behind. We'll keep our heads down, keep working hard and hopefully get closer to the pack." United were resolute defensively and capable on the break; elements of a performance which were real positives for Paatelainen. "It was a pleasing performance defensively and also offensively," he said. "I thought second half we passed the ball at times really well. All in all, a really concentrated and determined performance from our players. "3-0 away from home against Ross County, who are a good team, well organised with plenty threats in their side. It was a really pleasing attitude wise, that's never been in question. Our players try. "We have made silly mistakes, today we were solid. "The ball bounced for us as well but we take it. So many matches this season we've not had the luck at all. Today we had it a little bit so we're delighted." It was a very frustrating afternoon for Ross County manager Jim McIntyre, who conceded the outcome was just. "Dundee United definitely deserved to win the game," he said. "We started well and lost the first goal from a set-play which is really disappointing. I thought from then it gave United something to hang on to. "The goal gives them belief and you could see that. We lost too many individual battles. That's not something I've had to say very often this season but it was not good enough on the day." County have occupied a top six position for most of this season but face a battle with a number of sides now in contention to undermine that target. "The next five games will determine how damaging that result is," McIntyre continued. "We've got to show a response, bounce back from that performance. The best way to do that is to have a game quickly which we have. "We can't accept the standards that we've seen today. We can afford the players to have an off day but we've got to make sure we bounce back from it".